Sometimes you want to convert some interfaces from 32bit interface counters to 64bit. Normally you should go in Data Sources page, find data source for wanted graph, change its input type, then reset maximum in rrd file, then reset the maximum in database. Too many movements. To automate this I made little plugin - Fix 64bit Counters. With this plugin you only click on image near the graph you want to convert, and all the dirty work is made by script. Hit save for one time even if settings from the beginning are totally like in the screenshot - just in case. Also you can choose graphs to convert in the “Graph Management” page. Just select needed graphs, choose a “Fix 64bit Counters” action in dropdown and hit “Ok”. If graphs could not be converted, you will receive corresponding message and when you press “Continue” it will fix all the graphs that it can fix. Fixing process is performed after the next run of poller (this is due to the need to edit rrd file), so 64bit counters are begin to work only after two polls. 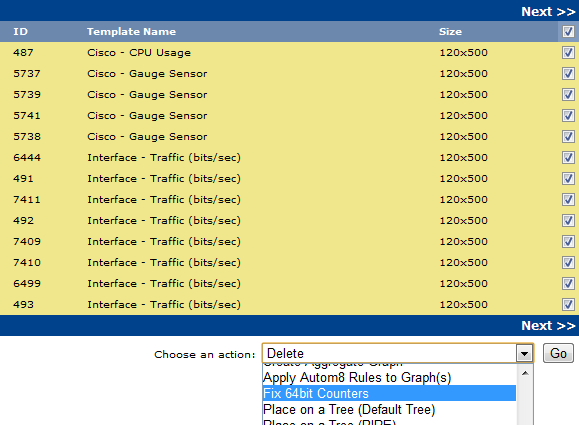 Checks are rather thorough, plugin checks SNMP version (it should be 2 or greater) and every SNMP query constraints. May be this plugin would save a day or two for someone. Icon is from FamFamFam Silk Icons. Added mass graph fixing through the “Graph Management” page. Uninstall and then reinstall plugin to use this functionality. Replaced short tags "<?" with long tags "<?php"
Last edited by shd on Thu Mar 22, 2018 11:32 pm, edited 8 times in total. You're sucking up my bandwidth. Yes, this is quite sure. I will go and have a try. I support Howies request to post it as advised. Any quick way I can fix it and revert back to the old counters ? Looks like some problem with SNMP on that box. Just go to settings/misc and set appropriate "SNMP query to search" and "Desired SNMP query". Do you know if there is a solution for windows. because 40% of my server are on remote site with non manageable switch, and so i can only monitor network on server interface. I installed the plugin, enabled it in the plugin managament tab and granted the rights in the user tab. also checked the settings in settings/misc. but there is no icon showing up next to the graphs? icon shows up only near graph that complies to "SNMP Query to Search" parameter. for example, it won't show up near the 64bit graphs if you are looking for the ordinary graphs. mhm - there is snmpv2 enable for this host..
Last edited by Sirup on Thu May 06, 2010 3:02 am, edited 1 time in total. found little "bug". i konw the reason why the plugin is not working here - but maybe there shouldn't be all that code inside the pop up window. replace "<?" with "<?php" in script bodies.